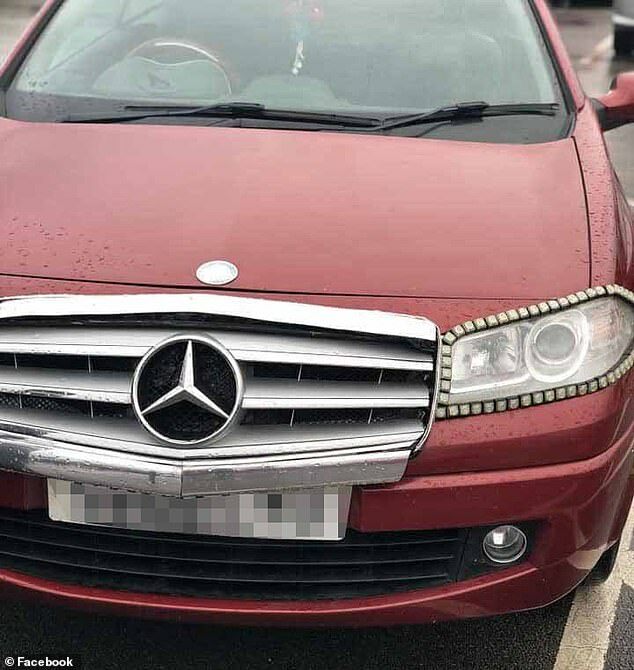 A deluded driver who attempted to disguise his Renault as a Mercedes has stunned social media users with his disastrous DIY - and his parking. 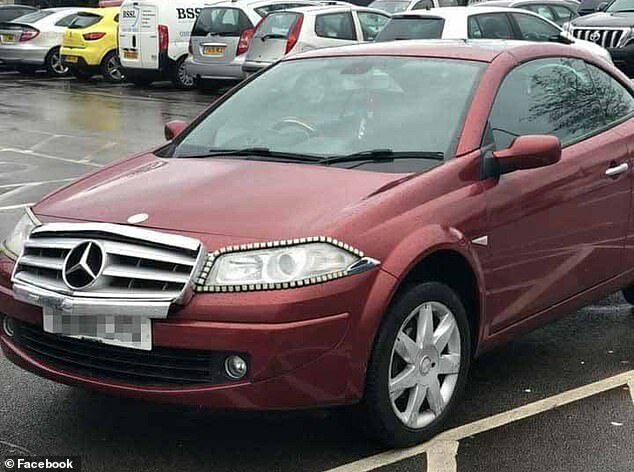 The burgundy Megane Cabriolet was spotted in a Tesco car park in Manchester, on Friday, complete with Mercedes badges and diamante trimmings. The 2008 plate motor - dubbed 'Frankenstein's Monster' - has a grill stuck to the front and a prominent symbol recognised globally as the luxury German car brand. The driver has even gone to the effort of sticking a Mercedes sign to the boot, too, before parking diagonally across a disabled bay. 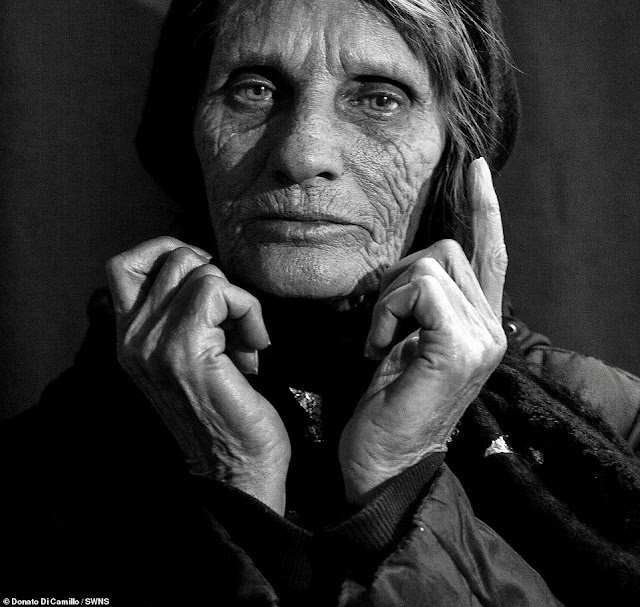 Rob Farrell posted the image on Facebook after spotting it in a car park in the Cheetham Hill area. So far, more than 7,000 people have liked the post and more than 14,000 comments have racked up on the hilarious images. 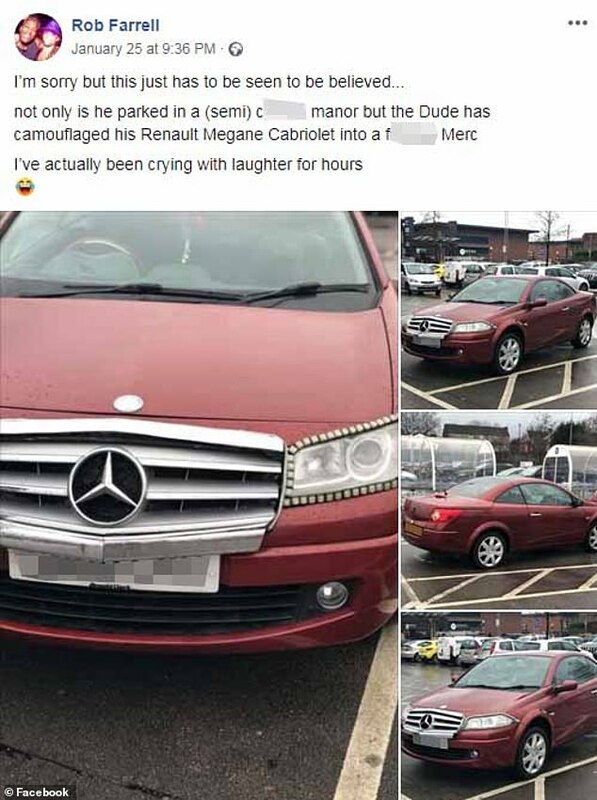 'Not only is he parked in a (semi) c****** manor but the Dude has camouflaged his Renault Megane Cabriolet into a f****** Merc. He added: 'The worst thing (for the owner of the thing creation) about this whole post.. is that dude genuinely would have been well chuffed to bits & proud of himself creating that Frankenstein’s Monster& In a few days his world has crumbled. Social media users found the images hilarious with one branding it 'the Renault mercgane'. Georgina Giles also spotted the car. Dean Bailey said on Facebook he has previously seen the car in Prestwich in Manchester, adding it has been like it 'for years'.